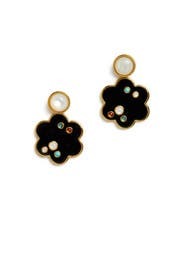 "Make any day delightful with these pretty poppy earrings by Lizzie Fortunato." 18K gold plated earrings with mother of pearl top studs and multicolor cabochons. Post backs for pierced ears. 1.75" long.